You will be given a reference e-book to read which has 386 pages And the test will be based on that e-book , you can take final test within 1 year of purchase. E-Business has become quite a buzz word since the Internet took hold in the last decade of the 20th century. The definition of an e-business is a business whose primary channels of commerce, business process and services rendered are through a digital medium such as websites, or other Internet-based channels. E-business can take many forms, and in many cases can be quite successful. Near the end of the 1990s, there was a major bubble burst in the e-business world, commonly called the”.com bust”. The cause of this was primarily a flooded market, as well as little experience in the community with how e-business should operate. This was a time of pioneers, as well as trial and error. In this second decade of the 21st century, there is much more experience and wisdom to be drawn upon for managing an e-business. As society becomes increasingly digital, e-business is going to be one of the primary channels through which many forms of trade and commerce are conducted. Despite what many business analysts believed when the Internet first took hold, digital technology is only going to increasingly infiltrate daily life, both professionally and personally. E-business management requires many of the same skill sets and instincts that traditional business management requires. However, there is an added need for an understanding of web trends, technology and the nature of the Internet itself when conduct the e-business management. E-business is very lucrative, when handled properly. Due to this, the demand for e-business managers is only going to increase ad infinitum. Those who have a flair for managerial positions, and wish to embark upon a new business venture, in a new and exciting field may find e-business management quite rewarding and stimulating. However, even those with business management certifications will find that e-business is a need of time, and therefore any e-business course is pretty necessary. Very few serious e-businesses will appoint such important positions to anyone who does not have an e-business management certification. Fortunately, many education providers are aware of the need for a competent e-business course. The best channel for this, especially for already busy professionals, is online certification. Online certification removes many problems that the traditional classroom environment creates. Along with removing costly tuition, online certification also allows one to study at one's leisure, removing interference with one's professional and personal lives. This makes it not only a time efficient way to learn, but also a cost efficient one. However, it's important to choose wisely when selecting an online certification provider. As with any competitive industry, there are bound to be greats and not so greats in this field. 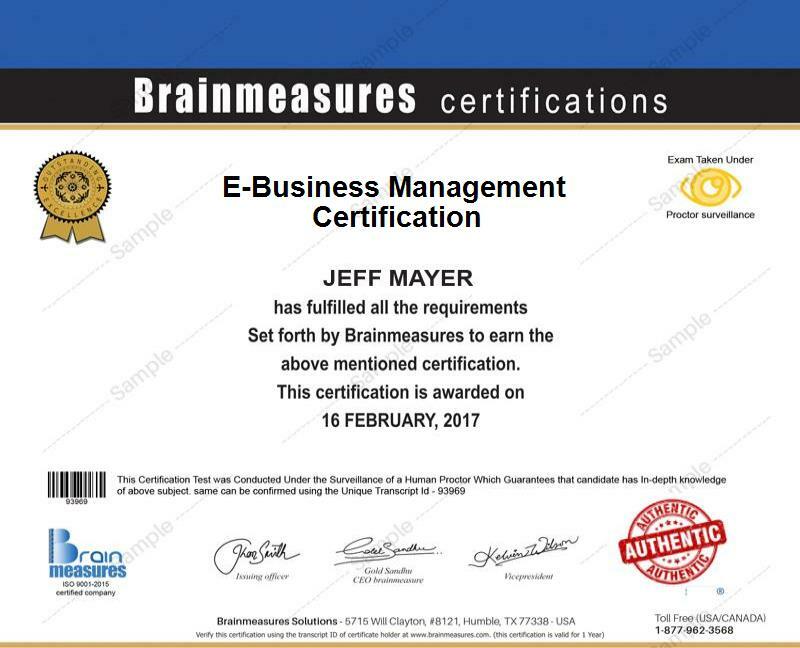 Brainmeasures is one of the true greats in online certification. This is because we have a unique, cutting-edge philosophy when it comes to our courses should work. When we plan a course, we consult closely with the best, most experienced professionals in a given field. We not only seek their guidance in ensuring that the information we teach is correct and inclusive, but we also listened to the stories they tell us. We incorporate the experience they in part through their stories, so that when a student completes one of our courses, they have not only a full and complete understanding of the material, but also a level of experience that otherwise they could never have starting out. No other online certification provider is willing to even attempt this, let alone at our prices. This certification consists of the e-business course, followed by a skill exam. Upon passing the skill exam, a certificate is awarded signifying a full e-business management certification. This certificate says more about a student, and about the company who hires them than any other certificate awarded by any other provider. It indicates Brainmeasures excellence. This course is designed intuitively, so that anyone willing to put forth the effort can complete and pass this course. However, like any management course, this is really ideal for those who have a flair for strategy, logistics and managerial practices. Add to this a love for technology, and digital communication. Salary Range The salaries can vary or many of these positions, especially self-employment and entrepreneurial ventures. However, some of the more traditional positions offered through this course have been known to earn between $100,000-$600,000 per year, with successful established companies.